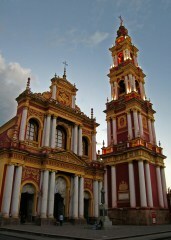 Explore the city of Salta, with striking architecture, whitewashed buildings and a beautiful leafy plaza. 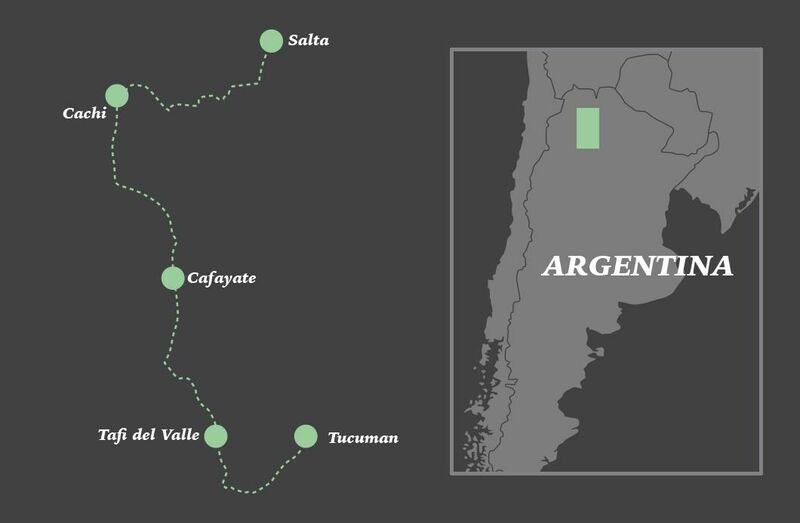 Try some of Argentina’s finest wines in the most stunning surroundings. Visit the Hill of Seven Colours. 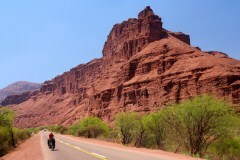 See spectacular desert formations on the road between Salta and Cafayate. Spend an evening at an Estancia in the picturesque village of Tafi del Valle. Travel through lush cloud forest to the cosmopolitan city of San Miguel de Tucuman. Day 6: Tafi del Valle to Tucuman via Sosa Canyon cloud forest. Tucuman city tour and departure transfer. Consider another day at leisure in Cafayate to soak in the spectacular views and do some more wine tasting. 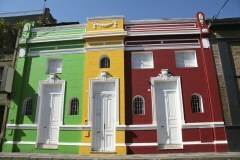 Salta and Tucuman are worth another day to explore their interesting streets and fabulous food. On arrival in Salta you will be met and transferred to your centrally located hotel where you will spend the next three nights. After a delicious breakfast at the hotel, depart on a guided tour to the most important places in Salta: the Cathedral (1855) where Gral. Güemes, patriotic hero, rests; Cultural Center America, Historical Museum of the North (Town Council) with exhibitions of sacred art and rooms dedicated to old traditional families of Salta, "San Francisco" Church, "San Bernardo" Convent, and the monument to General Güemes. We ascend to "San Bernardo" Hill to enjoy the panoramic view of the city. After a visit to "Batalla de Salta" Monument (Battle of Salta), and "20 de Febrero" Park (February 20th Park), we travel towards the outskirts and visit a summer village called "San Lorenzo", characterised by the subtropical microclimate. Lastly, we’ll visit the Artisan Market where craftsmen of the entire province expose their original crafts. After a delicious breakfast at the hotel, depart on a guided tour to Humahuaca Gorge. We’ll leave from Salta City and after a while we’ll arrive at Purmamarca Village, where you will have time to look closely at the well-known Hill of the Seven Colours, the Church and the Craft Market on the square, and even take a brief stroll down its narrow streets and get in touch with the locals. Then, we’ll continue towards Tilcara town, where you will visit the ancient ruins of Pucará and the Archaeological Museum. Visit Huacalera, which offers unique events such as the Crossing of the Capricorn Tropic, from where the colours of La Pollera del Coya Hill can be seen. There will also be good opportunities to take pictures here by daylight. You will then be taken to visit the town called Uquía and its church, where the paintings of the “Arcabuceros” Angels are the most important legacy kept in Cuzqueña School zone. The arrival in Humahuaca will be at noon. This town has an important Church and the Independence Monument (the Indian) of the sculptor Soto Avendaño. After lunch, on the route coming back to Salta City, you will look at La Paleta del Pintor (Painter’s Palette) framing the town of Maimara and Purmamarca. Return to Salta City. Breakfast at hotel. The journey starts in Salta and from there we will go up the famous Cuesta del Obispo, from an altitude of 1,100 m to 3,348 m in only 20 km. once in Los Cardones National Park we will descend to the Encantado Valley, which marks a transition between two climatic regions: Monte (with jungle-like vegetation) and Pre Puna (an arid plateau). If weather permits, you might be gifted with the majestic flight of a condor over you. Continuing with the trip, we will go across th e Payogasta Village and a few minutes later arrive at Cachi for lunch time and to visit the picturesque chapel and the archaeological museum. Then we will continue to the south along the famous National Route No. 40. This will take us through other small villages such as San Jose, Seclantás, and Molinos (also known as “the Poncho’s Capitol”). Molinos has an historical chapel built in the 17th century and a Vicuñas breeding place (one species of Lamas) that belongs to a local artisanal cooperative. After Angastaco, you will observe one of the strangest landscapes in South America, called "Quebrada de Las Flechas", where the strong contrast between desert, green valley, and snow-capped mountains in the background will take your breath away. After San Carlos, we will visit the most important wine areas of the region. First, Animaná (name of the local Indian tribe), and finally the small city of Cafayate, which offers 10,000 habitants surrounded by wineries and extended vineyards. In the morning you will have a couple of guided tours at some local wineries to se e the wine process and then taste the different wines produced in the area. 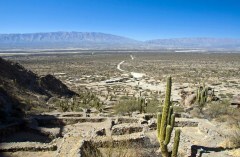 Then, we’ll set off south from Cafayate for the first stop at the Quilmes ruins, the largest pre-Columbian settlement in Argentina. The ruins are an outstanding example of the urbanisation of the culture Santamariana, and your guide will give you a brief tour of the site. 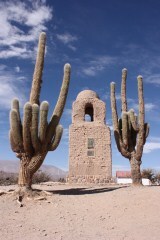 Apart from the ruins, the local cacti are particularly splendid. From Quilmes we continue on a spectacular drive over the mountains to Tafi del Valle. Tafi is a small picturesque village in a valley surrounded by mountains and is 1,976 m above sea level. You will enjoy an afternoon and evening at leisure. Today you will continue from Tafi del Valle to San Miguel de Tucuman, descending through the spectacular cloud forest of the Sosa Canyon. On arrival in Tucuman you will have time for lunch before enjoying a guided tour of the main sites of Argentina’s fifth largest city, including the Historical House of the Independence Declaration, Casa Padilla Museum, and the well-manicured Plaza Independencia. Casa Histórica, two blocks from the plaza, is where Argentina declared its independence from Spain, while Museo Arqueológico displays important documents from that era. In the late afternoon you will be transferred to the airport to take your outgoing flight.